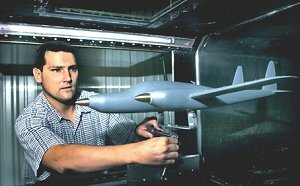 Neil Morrow holding a model of the Boomerang. Oregon-based Morrow Aircraft Corporation was formed in 1996 to develop general aviation aircraft using advanced composites materials and state-of-the-art technology, for the purpose of developing a national, "on-demand", air-service for travelers. Its founded, avionics entrepreneur Ray Morrow and his son, snowboard entrepreneur Neil Morrow, also set out to found a local air taxi company, an air-service that would be competitive with airlines, fast, safe and convenient, and to produce for it a dedicated aircraft type, tailor-made for the SkyTaxi service. They settled on a modified version of Burt Rutan's Boomerang design and determined that the best business approach would be to manufacture the aircraft and run the air taxi services themselves. The SkyTaxi company (a subsidiary of Morrow Aircraft Corp.) was founded in 1997 using Cessna 414s as interim aircraft. SkyTaxi was an "on-demand" air charter service, based on standard economy fares. The SkyTaxi concept aimed to provide services to remote communities which do not have access to traditional airline services. Under the original agreement reached in October 1998 between Rutan and Morrow, Scaled Composites contracted to build one prototype of the MB-300 Boomerang, and two preproduction examples for certification. On further production components would come from Scaled Composites' Montrose, Colo., plant and go to II Morrow in Salem for assembly. The MB-300 was 15 per cent longer than the original Boomerang with approximately 20 per cent greater payload and 30 per cent greater cabin volume: the MB-300 added 250mm to the length, 100mm to the height and 50mm to the width and was configured with a lavatory. The airplane was powered by two reciprocating engines, each equipped with an electronic engine control system with full authority capability in place of a hydromechanical control system. Proof-of-concept studies were undertaken with the Boomerang prototype (N24BT) owned by Burt Rutan, and 250 hours had been accumulated by mid-2002. In 1999, Morrow applied to the Federal Aviation Administration (FAA) for a type certificate. Construction of the prototype, made largely of composites and powered by digitally controlled Teledyne Continental TSIO-550 engines, formed phase one of Morrow's plan, for which $3.5 million were raised. The second phase was to cover construction of two more aircraft for certification, while phase three involved certification, the start of manufacturing and the launch of the SkyTaxi service. Funding for the final two phases was expected to be raised through "additional private placements or an early initial public offering", said Morrow in 2001. But to convince investors was not always easy: "Everyone wants to know why it looks so different, then there is the propeller versus jet debate and the air-taxi concept," Morrow explained. The company therefore had to focus on explaining the Boomerang concept, which was designed to eliminate the single-engined handling problems experienced with most twins, while promoting its low-cost advantages compared to a small turboprop or turbofan-powered competitor. In 2000, the Federal Aviation Administration published a notice seeking comments on Morrow Aircraft's proposal to use an electronic engine control system (FADEC) in place of the engine's mechanical system. Morrow revised his strategy to include leasing and operating the aircraft, as well as manufacturing it. "We are changing the business to something like the American Blimp concept," says founder and president Ray Morrow, who also co-founded American Blimp, an airship manufacturer that operates them predominantly for advertising purposes. SkyTaxi received its original FAA air carrier certificate early in 2002 and began operation on April 20 using only one aircraft at a time. In August SkyTaxi received FAA approval to fly an unlimited number of aircraft for its franchised air taxi concept, clearing the way for a fleet expansion plan which could amount to 1,500 by 2010. To promote the service, Morrow set up franchises in Corvallis, Aurora, Olympia, La Grande and Baker City and developed an on-line reservation system through which destinations, trip times and fares could be arranged and also discussed licensed manufacturing rights with several overseas companies. The MB-300 prototype was one-third complete by early 2002, and the type was provisionally due to enter service during 2005. The company anticipated a US-wide expansion of its SkyTaxi network by 2011 and Morrow expected the fleet to grow dramatically - from just three aircraft in 2003 to over 100 by 2005 and up to 4,550 by 2011. Yet development of the MB-300 was frozen in mid-2002 to concentrate on its SkyTaxi fleet of Cessna aircraft, with the intention of re-starting development at a later date pending the launch of the full service. However the MB-300 prototype was never completed and the plan to have a dedicated SkyTaxi type was eventually dropped. No photos of the MB-300 prototype have ever surfaced. And yet we may not have seen the end of the Morrow Boomerang just yet: in June 2009 Burt Rutan mentioned his Model 356, "a turboprop Boomerang which we are doing for Dale Johnson [vice-president at Morrow Aircraft], who wants to put the Boomerang in production as an eight-place turboprop Dynamite airplane." And with the attention the original Boomerang received at Oshkosh's AirVenture, many in the aviation community are hoping the unusual airplane might attract the attention of a potential customer who might take the Boomerang to the next phase of development.